Born on October 5, 1950, in New Castle Pennsylvania, Mr. Stranahan grew up in Mercer, Pennsylvania and attended Mercer Schools, graduating in 1968. While at Mercer Schools, Mr. Stranahan was a member of the National Honor Society and graduated with honors. During high school, he was a varsity basketball and cross country letter winner. In 1972, Mr. Stranahan graduated from Allegheny College, Meadville, Pennsylvania with a Bachelor of Arts in Political Science. In 1973, Mr. Stranahan enlisted in the United States Marine Corps receiving basic training at Parris Island, South Carolina; infantry training at Camp Lejune, North Carolina; and was stationed in Washington, D.C., at Marine Corps Headquarters. This followed the Stranahans’ long family history of service in our military dating back to the civil war. Following his military service, Mr. Stranahan attended the Thomas M. Cooley School of Law in Lansing, Michigan. In 1979, he graduated with a Juris Doctor degree. Immediately following his graduation, he sat for and passed the Pennsylvania Bar Exam and was admitted to practice in Mercer County in October of 1979. Mr. Stranahan was also admitted to practice before the Pennsylvania Supreme Court and Western District of Pennsylvania Federal Court. 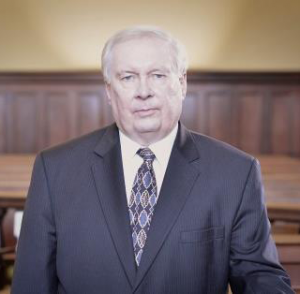 He is currently a member of the Mercer County Bar Association and the Pennsylvania Bar Association, and has served as a member of the Mercer County Bench-Bar Committee. Initially, Mr. Stranahan’s trial work involved criminal cases. After a number of criminal trials, he has moved his focus to civil matters. Currently, he tries only civil lawsuits, which would include: medical malpractice, serious accident and personal injury cases, and contract litigation, in Mercer County and surrounding counties. Mr. Stranahan’s main practice areas include: Plaintiff’s Personal Injury, Wills and Estates, Real Estate, and Family Law. Mr. Stranahan is a member and elder of the Trinity Presbyterian Church, located in Mercer, Pennsylvania. He is a former member and former President of the Mercer Rotary Club, a former President of the Mercer Area Chamber of Commerce, and is currently a Trustee on the George W. Wright Fund. Mr. Stranahan resides in Grove City, Pennsylvania with his wife. He has two (2) sons, James and John, both of Pittsburgh, a daughter, Courtney, of Michigan and five (5) grandchildren. His hobbies outside of work include following local and Pittsburgh sports teams, reading history books and golf.